Motors, lights and other electrical output devices can be connected to Learn & Go via 4mm jack plugs. A simple on/off device such as a light can be connected to Ouput 1,2,3 or 4 with one wire in the red hole for that Output and the other wire in the corresponding black hole for the same Output (not shown). A K'NEX control motor may be connected across red Outputs 1 and 2, as shown in the photo. Turning on Ouput 1 then drives the motor forwards, or turning on Output 2 then drives the motor backwards. 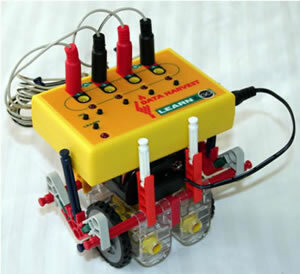 A second K'NEX control motor can also be connected across red Outputs 3 and 4, as shown in the photo. Turning on Ouput 3 then drives the motor forwards, or turning on Output 4 then drives the motor backwards. 1. Press the LEARN button (use a definite press) - the device red status light will be lit solidly. 4. Press the GO button again to run the stored sequence (the device status light will be lit solidly as the sequence runs). 5. Press the LEARN button to stop the sequence running - the status light will flash. To run the stored sequence again press the GO button. To replace the existing sequence with a new version press the LEARN button. To switch off Learn & Go, disconnect the power supply. The sequence is stored even if the power is disconnected. When the power is re-connected the status light will flash. 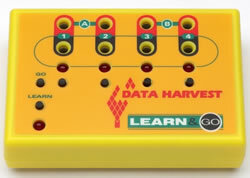 Press the GO button to run the stored sequence or press the LEARN button to create a new sequence. It is worth spending a little time getting used to the button presses before starting the activities. Learn & Go is able to learn the order in which switches are pressed, how long each switch is held down, and how long between the presses. 1. To learn a new sequence - press the LEARN button and then press the output buttons to create a sequence. 2. To run the stored sequence  press the GO button and Learn & Go will play back the last stored sequence continuously until stopped. An outputs LED will light up while its button is pressed to signify that Learn & Go is storing the action. More than one output button can be pressed at the same time. 2. Between button presses  so wait the required time before selecting the next output. 3. Between the last output button press and stopping Learn mode. Learn & Go can hold up to 64 actions in its memory - a press is one action, releasing the button is another. When Learn & Gos memory is full, it will automatically leave Learn mode and the status light will flash. Learn & Go remembers the last stored sequence, even if the power is disconnected. 1. Playing a stored sequence (Go mode) - output LEDs will light on and off as selected in the sequence being run. 2. Creating a sequence (Learn mode) - output LEDs switch on when an output button is pressed. If the status light is flashing Learn & Go is not in either the Learn or Go mode. Press the GO button to leave Learn mode, press the LEARN button to leave Go mode. 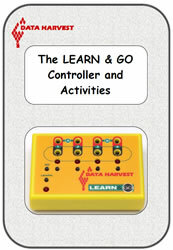 Click here to download the full Learn & Go manual, which includes details of some non-K'NEX-related activties you might like to try with your Learn & Go.